Showers Clear Out Monday Morning, When Will the Heat Return? Tonight: Downpours exit. Staying cloudy. Lows in the low 60s. Monday: Any early showers clear. Clouds will be slow to move out. Highs around 70. Tuesday: Sunny. Nearly perfect. Highs in the mid 70s. Our mostly dry stretch of weather continues. Although we did see some downpours roll through on this Sunday afternoon, it wasn’t widespread enough to have much of an impact on our abnormally dry weather. Boston has recorded a 1.88” rainfall deficit so far for June, and May was dry with a deficit of more than 1.5". Clouds will be stubborn Sunday night, and showers may linger into the early morning on Monday. We will see a gradual clearing throughout the day. With the onshore flow, temperatures will be unseasonably cool. High temperatures will reach the upper 60s and low 70s. Tuesday will be nearly perfect. Highs will climb into the mid 70s under sun-filled skies. Wednesday that sunshine will fade behind some high clouds associated with a warm front. Thursday does look unsettled with widespread showers and thunderstorms. Some beneficial rain will be possible. Heat returns by Friday. Temperatures will increase into the 80s with humidity ramping up as well. Ninety-degree warmth is possible starting by next Saturday. It has been 53 days since the last 90-degree day in Boston. 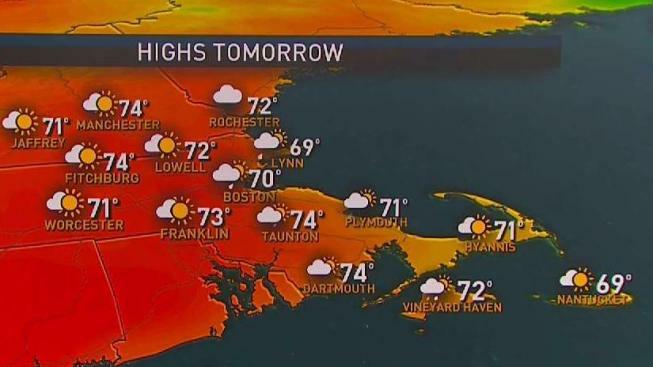 It’s likely that parts of New England will experience a heat wave by the weekend, and it’s possible it could stick around through the 4th of July holiday.